Your pool may be winterized right now but come spring time, it’ll be time to do a few essential maintenance tasks. One that’s always near the top of our lists is a good scrub of your pool tile. Unbalanced pH levels can result in the calcium carbonate present in your water to separate and cause unsightly patches on your pool tiles. Often these blemishes are white, gray, or even brown. Test the Total Alkalinity and adjust as necessary if it falls outside the 80-120 ppm range. Test your pool’s pH levels. You want a reading to be between 7.2-7.6. Next, address your calcium hardness levels. High levels of calcium exacerbate the risk for scale. 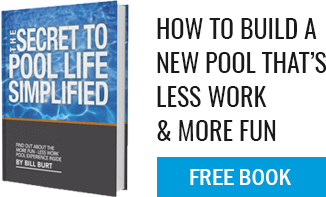 To change, you can either add a scale inhibitor or add soft water to your pool. To prevent scale buildup, set a regular schedule of cleaning and testing your water. If your water chemistry is off, add the right chemicals to balance and retest. Last, but not least, address any areas of scale buildup near the waterline with a good scrub from a pool brush or sponge. If you like, you can also use a tile cleaner, specifically designed for your pool. If you notice this is an ongoing headache or don’t have the time to take care of the problem yourself, give our team a call!